I’d like to share with you the most persuasive story ever told, and show you how some of the most successful B2B businesses today are using it to dominate their markets. What evidence do I have for this story being the “most persuasive ever told”? This is the story that religious, political and social ideologies & movements have used throughout human history to persuade billions and billions of people to give up their time, money, freedom, friends, family and even their lives for it. Some of the most successful companies selling software & services B2B have cottoned on to the power of this story and have used it to create ideologies that enable them to dominate their market. Salesforce who are so dominant in their industry that their increase of market share in 2017 was more than the rest of the top twenty other CRM providers combined. Zuora, the subscription payment solution provider, that is valued at $1.4 billion. The Ken Blanchard Company, a management training company that makes over $50 million in annual revenue and has sold over 18 million copies of their book: The One Minute Manager. Gainsight, a platform designed to help businesses retain and support their customers. It was recently named the 15th fastest growing company in the whole of the United States. 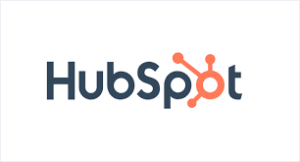 Hubspot, the marketing automation platform, that grew from $0 to $100 million in annual revenue in 8 years and remains (after over a decade) the leader in marketing automation category with 23% of market share. So, what is this story? Let’s demonstrate it through a real-life example. In 2005, Dharmesh Shah had itchy feet. Having sold his previous company, he enrolled in MIT business school looking for his next project. Over a decade later, Hubspot is no longer a startup but a public company (having grown from $0 to 100 million in annual revenue in 8 years) and remains the leader in the marketing automation category with 23% of market share. I don’t know whether his wife has forgiven him, but I do know that he credits the success of Hubspot to the fact that he didn’t build a business but a “quasi-religion”. Let’s look at how he used this story to create that ideology. At the risk of stating the obvious — heaven is a desirable outcome, whereas hell is an undesirable outcome. In Hubspot’s story, heaven was having customers and hell was having no customers. Almost all B2B businesses using this story have the same heaven and hell because, when selling B2B, there is only one value driver — money. Either making it or saving it. Even saving a business time is ultimately saving them money. The devil is an external enemy that will, if we follow/listen to it, take us to hell. The devil in Hubspot’s story was traditional marketing. What they called “outbound marketing” — cold calling, adverts, email blasts, trade shows, television adverts etc. Hubspot said that “outbound marketing” was broken and no longer worked in a world where more and more people were using the internet to discover solutions for themselves. Hubspot said that any company that continued to use traditional marketing approaches would find their messages ignored and would struggle to get customers (the hell in Hubspot’s story). A doctrine is a set of beliefs and ideas that are unique to the ideology. This doctrine must be followed in order to reach heaven and avoid hell. In Hubspot’s case, for their customers to reach heaven (more customers) and avoid hell (no customers) they needed to believe in and follow the doctrine of “inbound marketing”. Inbound marketing was a unique doctrine that Hubspot created. It stated that you should set yourself up to “get found” by people already learning about and shopping in your industry. And you did this by setting up your website as the “hub” of information in your industry. This was the opposite of “outbound marketing”. But in 2005, it was. Internet usage was relatively new. Pew research at the time found that only 30% of all internet users even knew what a blog was. Inbound marketing is so prevalent today because of Hubspot’s success in promoting it. The fact that they created their own movement was critical to their success — inbound marketing was unique to them. There were plenty of marketing automation companies when they launched — by creating their own doctrine they differentiated themselves from every other business in their category. They didn’t jump on the bandwagon of another movement. They became the authority and thought-leaders of the inbound marketing movement and this is reflected in their dominant position in their market. The leader is a person or organization that provides the guidance and tools necessary to implement this unique doctrine. In religion this would be the religious body and spiritual leaders, in politics this would be the political party/group. In Hubspot’s case (and every other business that uses this story) it’s them. They provided the guidance (their training certifications in inbound marketing, their free content on their blog, their “Inbound” conference, etc.) and the tools (their software) to implement inbound. It’s important to note that the tool is of secondary importance in the story — the primary goal of this story is to sell the doctrine. If the doctrine is believed in, then using the tool will happen automatically. For example, the Catholic religion doesn’t focus on selling the benefits of attending a local church — they focus on selling their doctrine. If someone believes the doctrine and becomes Catholic then attending and supporting the church (at least at Christmas and Easter) happens automatically. In the same way, Hubspot focused on selling the doctrine of inbound marketing. If a business decided they needed to do inbound then they were very likely to use Hubspot because their tool is specifically designed to help businesses implement it. Hubspot actually designed their solution for their doctrine of inbound marketing from the very beginning — they came up with the doctrine of inbound marketing before they created their solution. But, this is not necessary. A doctrine can be created to fit an existing solution — this is what Boston based startup Drift have done to great success. One doesn’t need to be a brand new company to implement this story. Firstly, this story works so well because, as mentioned above, it’s not selling a product — it’s selling a set of ideas. The product is of secondary importance. We say that the pen is mightier than the sword because ideas are the most powerful things in the world. A doctrine is a set of ideas and this is why this story is much more powerful than any story selling a product/solution alone. This story creates an ideology and a movement — this is far more powerful than any business. Of course, Hubspot’s customers are very unlikely to go to such extreme lengths for inbound marketing as they do for their religion or political beliefs. But, this story harnasses some of that power for something that is, on the surface, very meaningless. There’s a reason that Hubspot’s customers are jokingly referred to as having “drunk the kool-aid”. Or why Salesforce’s annual conference attracts over 150,000 attendees each year whilst Microsoft’s (a company with many more years in business, more revenue and more customers) attracts only 15,000. Secondly, this story plays on our tribal need for simple good versus evil. There is nothing in this world that is black and white — it’s all shades of grey. But we prefer things to be simple. Us versus them. Good versus evil. Look at nearly every popular story ever told — whether that be via film, television theatre or books. Good versus evil is everywhere. Thirdly, the story is repeated everywhere. Repetition is a powerful way to convince people of something — studies have shown that even bare-faced lies can be accepted by people given enough repetition of the message. As such, the entire basis of Hubspot’s marketing and brand message was selling the necessity of inbound marketing — from blog posts, videos, interviews, and books. By making this story the bedrock of their communication, they harnassed the power of repetition to convince businesses that they needed to ditch traditional “outbound” marketing and start doing inbound. We’re currently living in a world where, if you sell software or services B2B, you are faced with more competition than ever before. 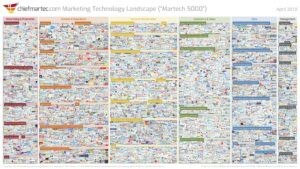 Just in the marketing technology space alone, the number of companies operating has increased from 150 in 2011 to over 7000 in 2018. That’s an increase of over 4500%. This story can give you the edge you need to become and remain the market leader in your space. I call this approach Ideological Branding because, instead of building a brand around a product or solution, it builds a brand around an ideology. It turns a brand into an ideology (like a religious or political movement) rather than simply a business.